NYC Expanded metal products come in several sizes, widths and lengths, starting from as thin as 20g and as thick as 9g. Our custom fabricated expanded metal is available in hot rolled steel sheet, galvanized steel sheets, Aluminum sheets and Stainless Steel sheets. Delivering expanded metal sheets to New York, available either standard or flattened style. Each style of metal and steel are fabricated in a process that perforates the metal sheet with oblong diamond like openings that are either raised for standard style or flattened smooth for flattened style. The steel sheet grade is commercial quality steel and is used by all steel fabricators frequently for commercial and residential projects. The galvanized steel sheet grade is the same as the steel grade but has been hot dipped galvanized with the protective galvanized zinc coating. In Aluminum the material grade available is 3003. This 3003 grade comes in a mill finish and is very versatile, light and easily suitable for most aluminum fabrication projects. The Stainless Steel sheets come in two grades either T304 that is most popular or T316. Stainless Steel offers greater strength and corrosion resistant properties, and also is very suitable for most metal fabrication products. Allied Steel of NYC, expert sheet metal fabricators that serve New York City and its boroughs every day.. Allied Steel NYC customer service professionals are among the best in the industry and will work with you diligently to meet your expanded metal product needs. Call 212 709-8123 or email us for more details on our expanded metal products. For New York City, our Perforated Metal products come in standard sizes and can have various hole types like round, square, slotted and decorative. This metal product is also available in Carbon Steel, Galvanized Steel, Aluminum and Stainless Steel. The Aluminum is offered in 3003 and 5052 grade and can easily be cut, bent and fabricated to your specifications. 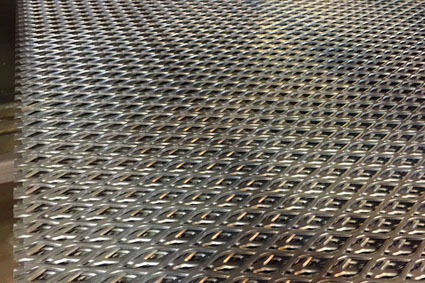 Stainless Steel Perforated metal comes in T304 and 316L grade and is another material option. Material thicknesses range from 20g to 3/8”depending on the material type. Allied Steel of NYC is one of the premiere perforated metal suppliers and custom fabricators serving all of New York City. Contact us now for more detailed information. 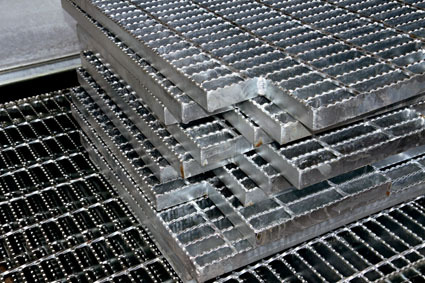 Metal Grating products come in various sizes, widths and lengths. Our Metal grating is made from Carbon Steel, Galvanized steel Aluminum and Stainless Steel. Standard Bar grating comes welded and in various finishes. Carbon Steel grating is Hot Rolled Steel and comes in a plain or painted black finish. The Aluminum grating is fabricated using 6063 T-6 grade material and comes in a mill finish. Stainless Steel grating comes in T304 material grade and also has a mill finish appearance. The sizes available, range from 1/8”to ¼” thick from 3/4" to 1-3/4” deep. All of these gratings can have optional surfaces that are custom fabricated to produce either a serrated, grooved or smooth finish. Grip Strut is another alternative metal product that provides a highly movement-resistant surface that is the champion of non-slip surfaces. It comes fabricated in 16g, 14g or 12g thickness with a raised diamond shaped surface that is serrated, and is available in Steel, Aluminum and Stainless Steel. The Steel comes either with a plain finish or can be Hot Dipped Galvanized as well. The Aluminum sections are fabricated from 5052 grade aluminum and have a mill finish surface. Stainless Steel fabricated sections come in 16g only and is made with T304 grade material. These grip Strut products are used in many applications such as catwalks, platforms, truck steps and vehicle ladders. Contact one of our steel professionals for more information. Allied Steel NYC only deals in quality metal products that meet or exceed our quality standards for NYC contractors. As expert steel fabricators we focus on our customers needs delivering outstanding customer service that keeps them coming back again and again placing additional metal and steel orders. During our decades of serving NYC, Allied Steel NYC has built a stellar reputation of reliability and quality in New York City and its boroughs, Brooklyn, Manhattan, Staten Island, Bronx, Queens and Long Island City, we constantly strive to maintain our best in class industry standing.